Ruth Bader Ginsburg, the tough and brilliant Supreme Court justice nicknamed "Notorious RBG" by the internet, surprised and disappointed many of her admirers on Monday when she declared that the Colin Kaepernick-led protests of the national anthem are "dumb and disrespectful." While she defended their right to protest, she also flat-out insulted those who have decided to take part in this one. "If they want to be stupid," she said in a Yahoo! News interview with Katie Couric, "there's no law that should be preventive. If they want to be arrogant, there's no law that prevents them from that. What I would do is strongly take issue with the point of view that they are expressing when they do that." Kaepernick, a quarterback for the San Francisco 49ers, set off the protest on Aug. 26, when he knelt while others sang the national anthem. When asked about the motivation behind his actions, he said, "I am not going to stand up to show pride in a flag for a country that oppresses black people and people of color. To me, this is bigger than football and it would be selfish on my part to look the other way. There are bodies in the street and people getting paid leave and getting away with murder." Kaepernick faced backlash from the public, Donald Trump, and even President Obama, who defended the quarterback's right to express his opinion on the matter but still characterized it as a "messy" example of democracy in the works. 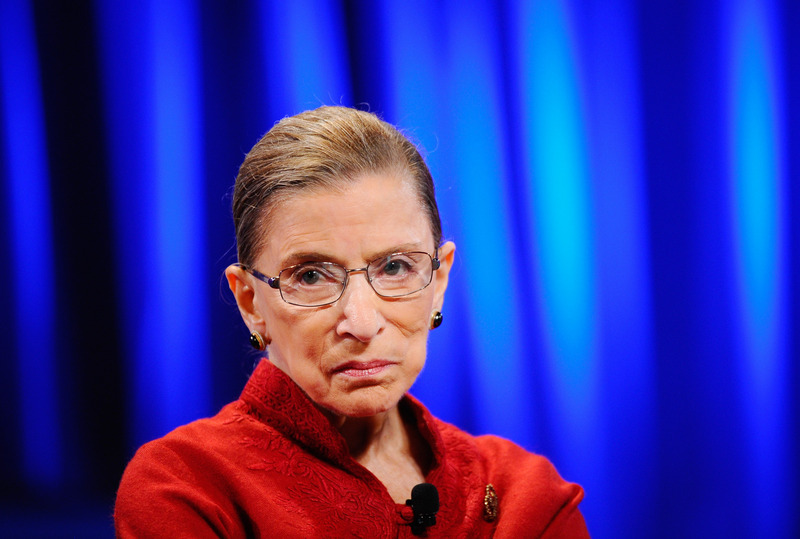 It surprised many to see RBG added to the list of people who find the protest distasteful. The Supreme Court justice has become an internet icon and hero for progressives over the past few years. In 2013, she became the first Supreme Court judge to officiate a gay wedding, she has a long history of battling racial discrimination, she's defended women's rights to get abortions, and has generally fought on the progressive side of most social issues. To hear her refer to Kaepernick and other football players as "stupid" and "arrogant" seems distinctly out of character. Her words are made stranger by the fact that directly prior to being asked this question, she spoke about the need to identify racial discrimination as a problem, and specifically touched on the police force. "We are dependent on police officers for our security, but they also should be cognizant of the community that they serve," she said. While it's RBG's right to feel uncomfortable with flag burning and refusals to stand up during the national anthem, it seems that her history working for equal rights should have afforded her a more nuanced view of the players currently protesting. Considering that she is not a member of the black community, and that the athletes joining in this protest are, she should have known better than to dismiss their method of expressing their need to show the country how they feel about racial discrimination and police brutality.